We are getting fewer – those of us who actually remember December 7, 1941. I was five-going-on-six and not only do I recall the date clearly but I have indelible memories of many of the peripheral things that came along with World War II – like the slogans than became part of our everyday lives and have now all but faded from memory. In a radio broadcast to the nation on the following day, President Franklin Delano Roosevelt began his speech, Yesterday, December 7, 1941, a date that will live in infamy the United States was suddenly and deliberately attacked… Soon every man, woman and child in the country was saying, “Remember Pearl Harbor” and quoting the opening phrase of FDR’s “infamy” speech. We quickly picked up the “V for Victory” hand signal popularized by Winston Churchill and we planted “Victory Gardens” and saved our allowances to buy “War Bonds.” I wonder how much association with World War II any of those expressions have these days. And how about “Kilroy Was Here?” I don’t remember having a clue what that meant but the Kilroy drawing and slogan popped up everywhere – the graffiti of the 1940s. 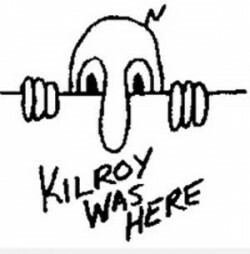 Now, 70 years later, Kilroy’s origins are debated. One theory identifies James J. Kilroy, an American shipyard inspector, as the man behind the signature. 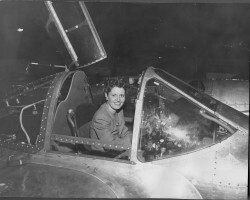 According to Wikipedia: During World War II, James worked at the Fore River Shipyard in Quincy, Massachusetts where he claimed to have used the phrase to mark rivets he had checked. The builders were paid by the number of rivets they put in. A riveter would make a chalk mark at the end of his or her shift to show where he had stopped and the next riveter had started. Dishonest riveters would erase the previous worker’s mark and chalk a new mark farther back on the same seam, giving themselves credit for part of the previous riveter’s work. Kilroy stopped this by writing “Kilroy was here” at each chalk mark. Ships were being sent out before they had been painted, and when sealed areas were opened for maintenance, soldiers found his unexplained name. Thousands may have seen Kilroy’s name on the outgoing ships and his apparent omnipresence created a legend. 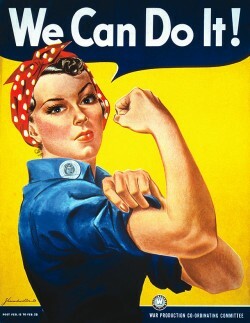 Another cultural icon popularized in the factories and shipyards, of course, was “Rosie the Riveter” who represented the nearly 19 million women who joined the work force for the first time during World War II. The name is said to be a nickname for Rosie Bonavitas who was working for Convair in San Diego, California. I always thought, of course, that Rosie was based on my mother who was a pipefitter’s helper at General Engineering in Alameda, California, and when she was chosen “Miss Safety” and was sent to Hollywood, I was sure of it! “Remember Pearl Harbor!” Yes, some of us still do. I believe that one of the tragedies of 9/11 was that the feeling of national unity so quickly faded. I lay that at the feet of the Bush Administration. Not only did it launch a war on the wrong country, but sought to do it at very little discomfort to the American public. It seemed to me to have been the perfect time to encourage moderation of oil consumption thereby making the Middle East irrelevant. The can-do attitude following December 7th became someone-else-can-do-it. Where was the use-it-up and wear-it-out philosophy of the Pearl Harbor generation? There’s a lot to think about today, but most people will be thinking how many more days they have to shop before Christmas. A WONDERFUL read and Stephanie’s comments are “spot on!”…..Thank you Sydney for this relevant reminder. Yes, today is the day and I remember hearing the announcement over the radio. Thank you Sydney for reminding us.